Click image to enlarge Tomahawk Island. Tomahawk Island, Oregon as seen from Ryan Point, Washington. Image taken June 15, 2003. Tomahawk Island is a one-mile-long island located on the Oregon side of the Columbia River between River Mile (RM) 107 and RM 108. Today it is connected to Hayden Island, creating one island. Much of the land of Tomahawk Island is now covered with gated communities and elegant homes and the area is a boating mecca with marinas and houseboats, and several boat dealers and nautical supply shops. 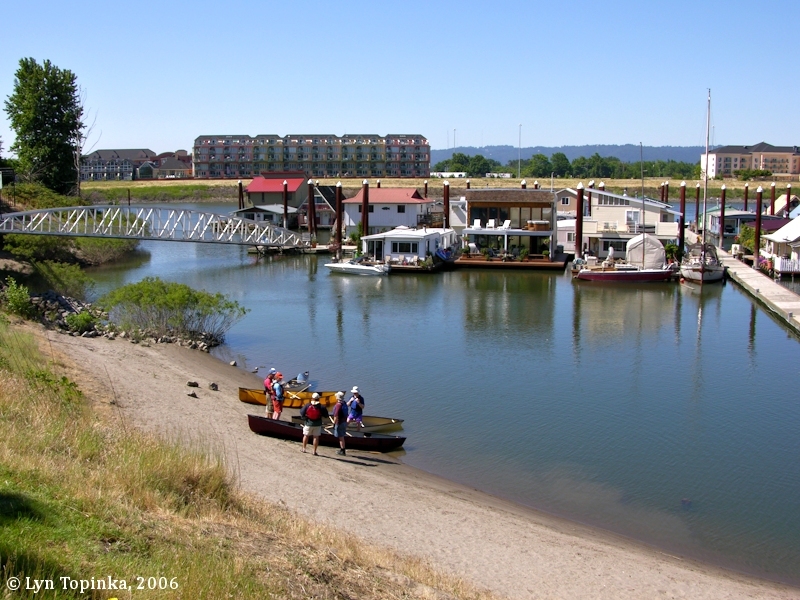 Tomahawk Island was once the home of the Columbia Beach and Lotus Isle Amusement Parks. 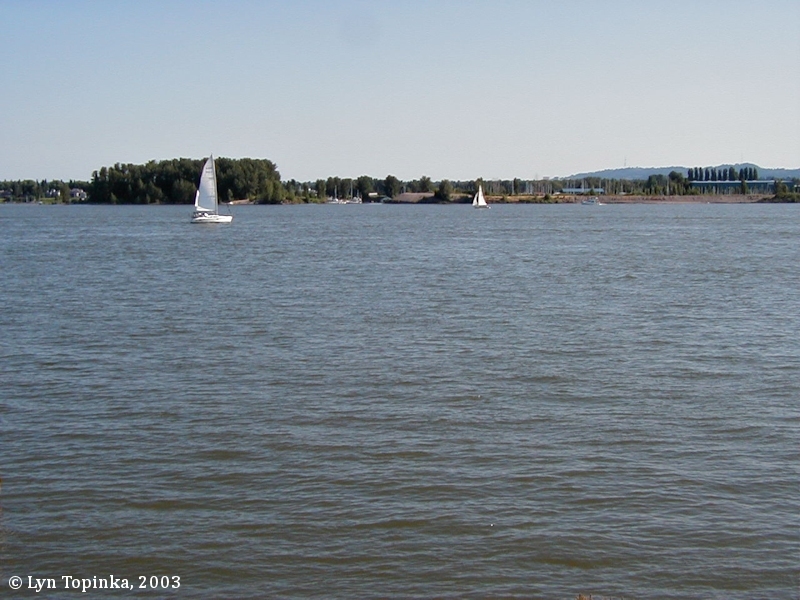 Lewis and Clark gave the name "Tomahawk Island" to a small island between "Image Canoe Island" (today's Hayden Island) and the prairie on the north shore of the Columbia River, which would become Vancouver, Washington. Tomahawk Island is not named on their route map [Moulton, vol.1, map#79] but is named on the draft map [map#88]. This name came after an incident where Captain Clark's tomahawk pipe was stolen. Today, Tomahawk and Hayden Islands have almost been consolidated into one island by river silting and road construction. Click image to enlarge Tomahawk Bay Moorage. View of Tomahawk Bay Moorage, with condominiums along the Washington State shore in the background where on March 30, 1806, Lewis and Clark set up camp. Image taken July 1, 2006. 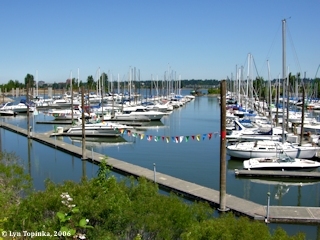 Click image to enlarge Tomahawk Bay Moorage. Image taken July 1, 2006. Click image to enlarge Beach on the south shore of Tomahawk Island. North Portland Harbor is in the background. Image taken July 1, 2006. Click image to enlarge Tomahawk Island shoreline bordering North Portland Harbor. Image taken July 1, 2006. 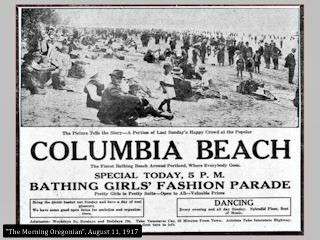 Between 1916 and 1926 the Columbia Beach Amusement Company operated a swimming beach/amusement park/camping ground (which they called "Columbia Beach") at the east end of Tomahawk Island, then known as "Sand Island". In 1926 a file destroyed the dance pavilion and the amusement park declined soon after. 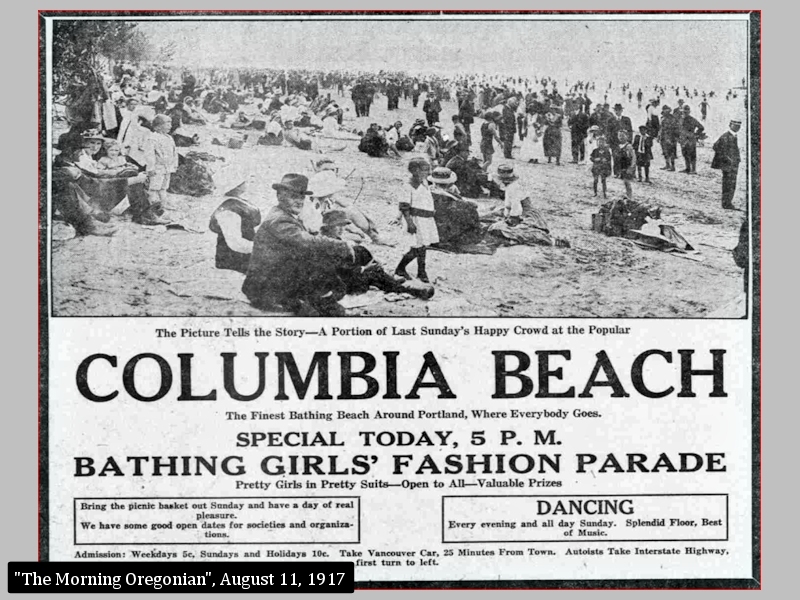 Click image to enlarge ADVERTISEMENT, Columbia Beach, "Morning Oregonian", August 11, 1917. The "Morning Oregonian", August 11, 1917, courtesy Historic Oregon Newspaper Archives, University of Oregon Libraries website, 2015. 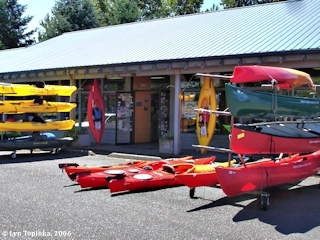 Click image to enlarge Alder Creek Kayak Supply, Tomahawk Island. Image taken July 1, 2006. 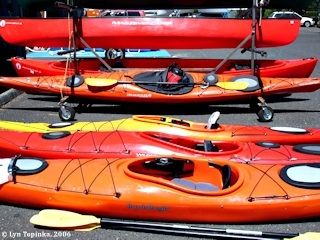 Click image to enlarge Kayaks and Canoes. 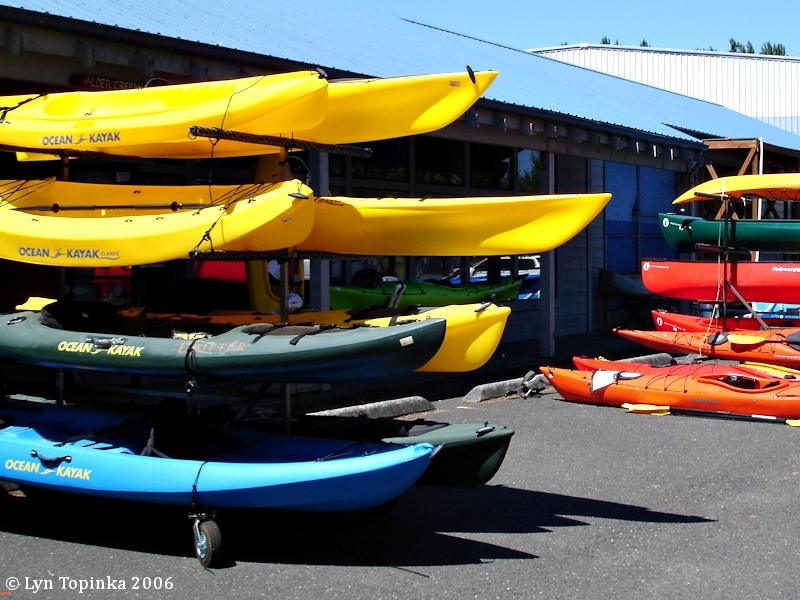 View at Alder Creek Kayak Supply, Tomahawk Island. Image taken July 1, 2006. 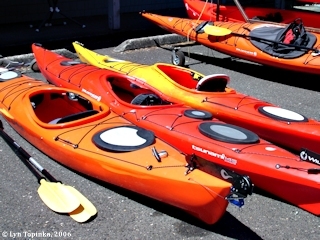 Click image to enlarge Kayaks. 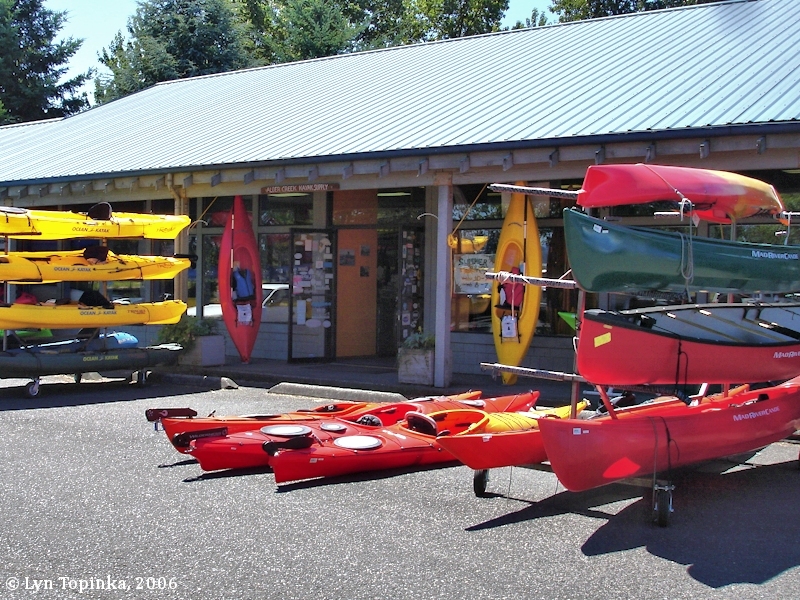 View at Alder Creek Kayak Supply, Tomahawk Island. Image taken July 1, 2006. In 1930 the Lotus Isle Company built the "Lotus Isle Amusement Park" on Tomahawk Island, a park which was known as the "Wonderland of the Pacific Northwest". 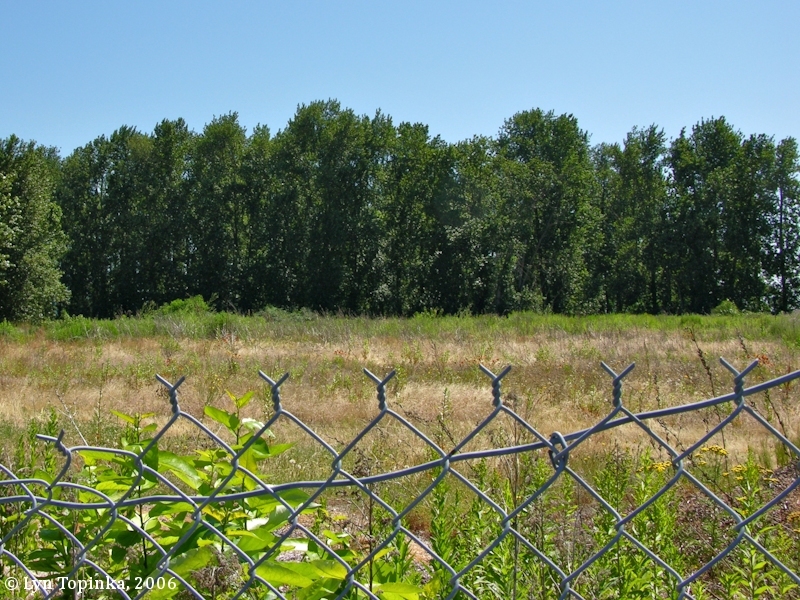 The park spread over 128 acres, had over 40 rides, and for a time it was Portland's largest amusement park, besting Jantzen Beach Park. 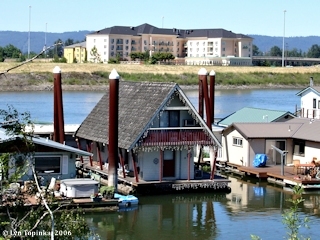 Access to Lotus Isle Amusement Park was either by a fixed wooden bridge crossing North Portland Harbor, or riding the Vancouver Streetcar and getting off at the main gate. Tragedies and disasters plagued the park, forcing it to close in 1932 in bankruptcy. Today, while some of the rides still exist -- the 4-abreast Herschell Spellman Carousel, made in 1914, is at Golden Gate Park in San Francisco, and the Spirit of the Alpine Coaster is at the Playland Giant Dipper in Vancouver, British Columbia, Canada -- nothing remains of the park. Tomahawk Island Drive goes to where the Amusement Park once stood. Click image to enlarge Eastern tip of Tomahawk Island. View from between the fence. The eastern tip of Tomahawk Island is gated off. Image taken July 1, 2006. 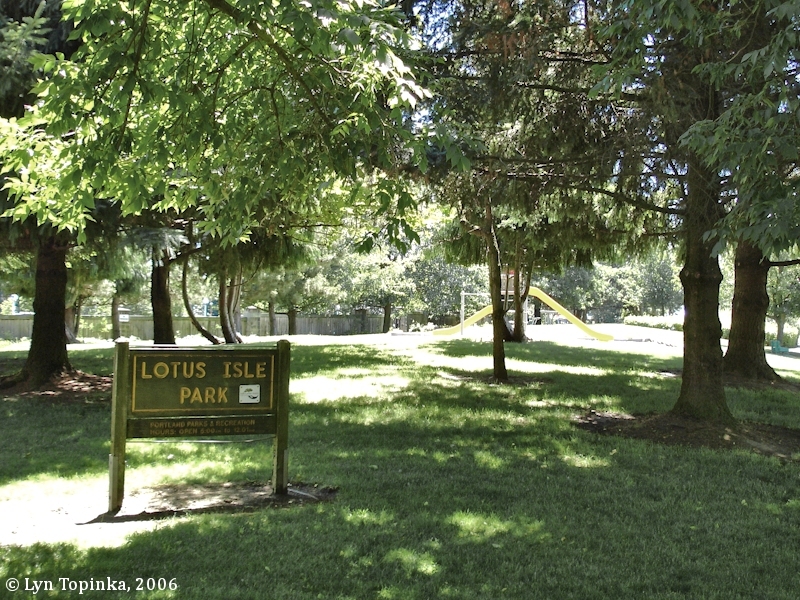 In 1992 the City of Portland acquire 1.72 acres on the south and west side of Tomahawk Island Drive where they maintain a small park called "Lotus Isle Park". 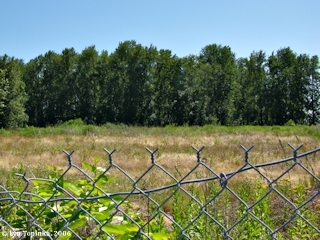 The park is on a spit of land jutting into North Portland Harbor. Pilings from the 700-foot trestle that once carried the streetcars to Hayden Island are still visible. 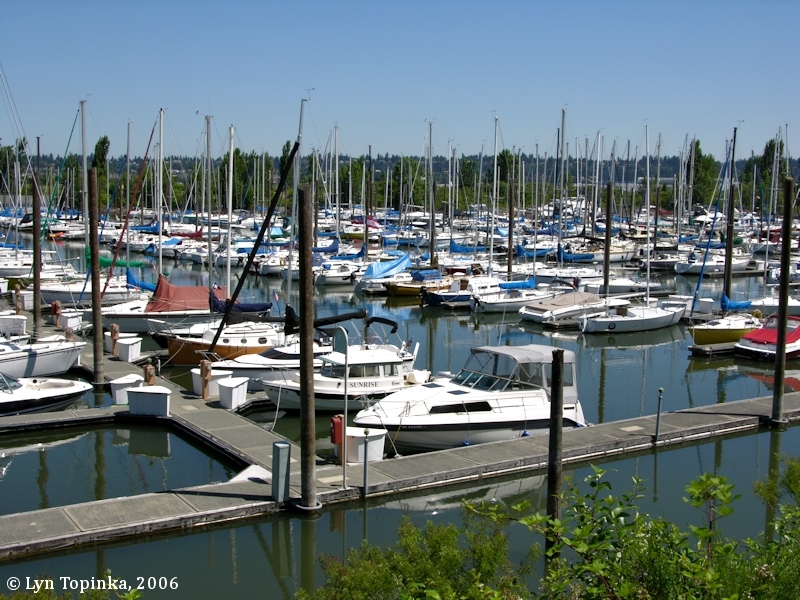 Today, much of this land has been developed, including moorages, houseboats, marinas, and condos. From the park, you can still see the pilings from the 700-foot trestle that once carried the streetcars that went on to Hayden Island and then to Vancouver, Washington." Source: Portland Parks and Recreation website, 2019. 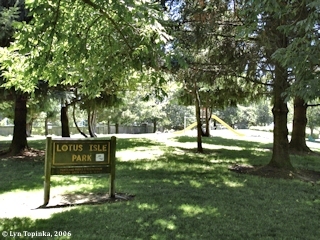 Click image to enlarge Lotus Isle Park, Tomahawk Island, Portland, Oregon. Image taken July 1, 2006. 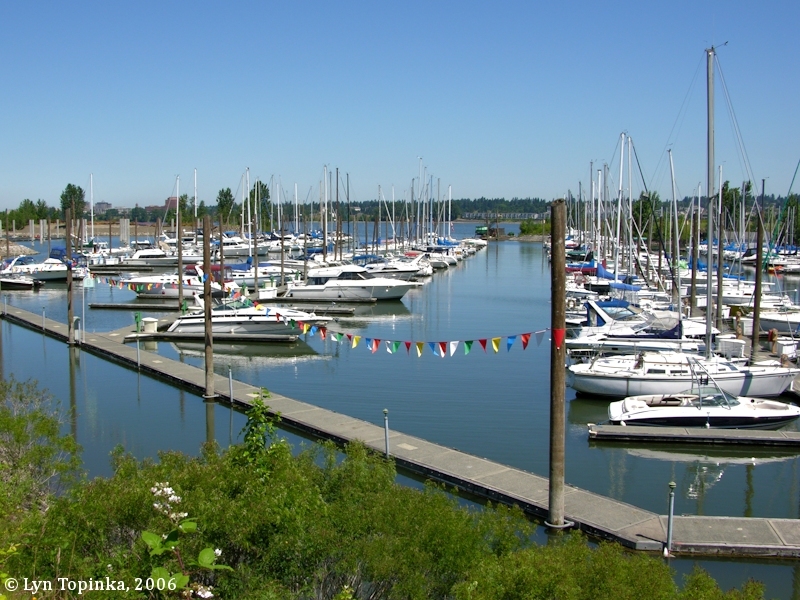 The North Portland Harbor is the official name of the channel which separates Hayden Island and Tomahawk Island from the mainland Oregon. 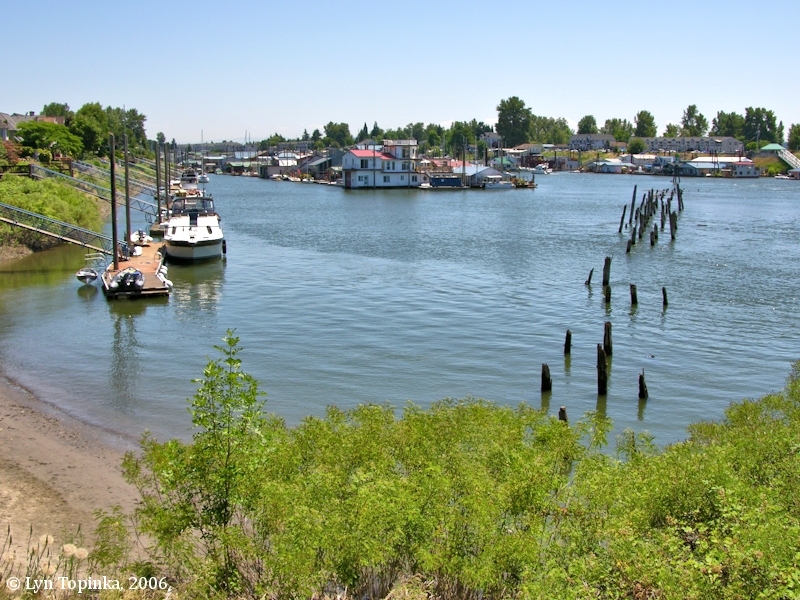 Throughout history it has had other names, including the "Oregon Slough" and "Hayden's Slough". 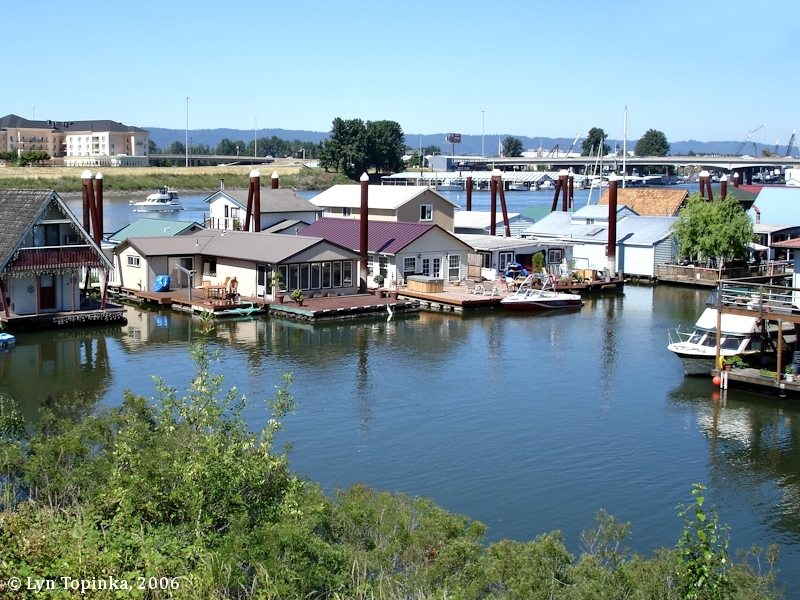 In 1913 the U.S. Board of Geographic Names made "North Portland Harbor" the official name. 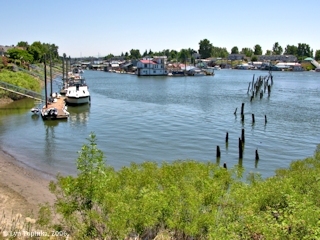 Click image to enlarge North Portland Harbor, from Tomahawk Island, Portland, Oregon. The Interstate 5 is in the background. Image taken July 1, 2006. Click image to enlarge Chalet, Tomahawk Island houseboat. North Portland Harbor is in the background. Image taken July 1, 2006. Pilings from an old 700-foot trestle that once carried streetcars from Portland to Tomahawk Island can still be seen in North Portland Harbor. This "Vancouver Street Car" let passengers off at the Lotus Isle Depot, at the entrance to Lotus Isle Amusement Park. A good view of the remaining pilings can be had from the east side of today's Lotus Isle Park on Tomahawk Island, or from the end of the road at Bridgeton. 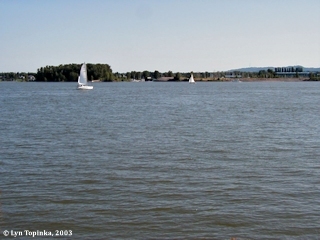 Click image to enlarge North Portland Harbor, from Tomahawk Island, Portland, Oregon. 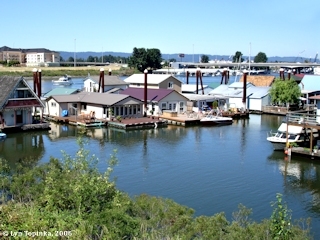 Pilings in foreground are the remains of old streetcar trestle connecting Oregon with Hayden Island. View from Lotus Isle Park, Tomahawk Island. Image taken July 1, 2006.